Of course you should all be sleeping now. unless that is youre still out gallavanting on the town in which case i guess it'll be more like good afternoon when you see this. Another beautiful day here in Tokyo. Hot and clear. Walked the dog, and now about to write some music for a performance on thursday. Left it a leetle bit late. Morning Wayne glad you have beautiful weather in Tokyo mate drizzly rain here in Kent. 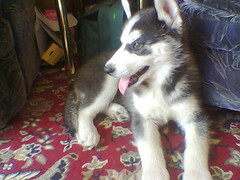 fine here at the moment.. had to get up because of the siberian husky pup which we have howling in his cage! was up at 4.15am with him first... then again at 7.30am. I jhave work later... and if the lad thats due to take over from me at 4pm rings in sick again, i'm gonna go ballistic !!!!! have a good sunday guys ! 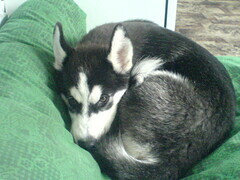 Still it's cool you have a husky puppy (pics? ), though puppies can be a pain when they're settling. I'd love one but live in the residential equivelant of a shoebox so it's a wee dog for me. the pup is 16 weeks old at the mo... he's already just a tad smaller than our other dog ( german shepherd/border collie cross) who is 13.
and this one was taken this morning..
morning all wow what a start to a sunday thread! wayne writing music and speed demoness dogsitting siberian husky's ! He's a really good looking husky. Nice colouring too. Nearly as big as a shepherd at 12 weeks? Gonna have your hands full with him. our cross breed is more border collie size actually... so a bit smaller than a gsd. but Bandit will deffinately be bigger than him... and already has some bloody good strength in him while he's out on the lead ! At least it will get the mud wet!! we have sunshine here now... but it's very windy! and thanks for your comments on my puppy guys... much appreciated! i'll take more pics as he grows and post em up if you're interested?